The 2017 Birthday Party in San Antonio, hosted by Inching Along, is "A Dome of My Own". The dome is not necessary for the project but is good to keep out dust and for some of us, cats. The dome is 12 1/2" tall with an 8" diameter. It retails at Hobby Lobby for $26.99, the product number is 184507. The matching base is 9" overall in diameter and retails for $7.99. The item number is 104489. We want everyone to have plenty of time to look for sales or buy them with a coupon before next February. (Additional note - they can be purchased elsewhere - just consider the dimensions). We look forward to seeing all of you at the Birthday Party. One of the changes we are making this year to the WWW is we are going to have a theme for the weekend and also a themed dinner on Saturday evening. The Theme this year is Alice in Wonderland. With that in mind, one of the new things will be a challenge for all the SAM's members that choose to participate. It is going to be a fun challenge that can be completed anytime between the 2016 and 2017 WWW event. In order to pull this off, I am asking for donations of cups and saucers. They don't even have to match, I just need to collect 100 sets. If you have some cups and saucers that your are willing to donate please bring them with you to the upcoming Birthday Party in Dallas on February 20th. I will be there to collect them from you. Looking forward to seeing everyone is a few short weeks. It is with regret that I communicate to you all that Sue Ezzell has resigned her current Executive Board position as Treasurer due to the unforeseen death of her sister. We all wish Sue well and hope to see her at the Dallas BDay Party and the Wonderful Workshop Weekend next September in Killeen. It is very exciting to communicate to all of you that Vikki Meeker has agreed to step forward and fill the Treasurer role for the balance of Sue's term. I appreciate so much that Vikki has agreed to serve SAM's in this capacity. Also, a big thanks to Lela Krieger for filing the SAM's 2015 Tax Return and filling in until we were able to get the Treasurer vacancy filled. See you all in Dallas at the BDay Party, there is only 1 opening left. Be sure to check the Social Forum for a new post about an estate sale this week (December 9th)! You can subscribe to the social forum to be sent an email when new posts are added. If you weren't in Temple at the Wonderful Workshop Weekend last month, you may not have heard that WWW is moving locations in 2016. We looked at available locations in the Central Texas area and presented the options at the annual meeting which included looking at dates, locations and facilities. Many questions were asked and answered and a vote was taken and the membership voted overwhelmingly in favor of moving to the Courtyard by Marriott in Killeen in 2016. This location is just 24 miles southwest from the Temple location and 20 miles northwest of previous Salado location. Mark September 16, 17 and 18, 2016 on your calendar and make plans to come next year. Due to an out-of-town emergency, the Passport has been delayed a bit. If you want to check out the classes for this year, click on the link at the top of the page. There are currently no nominations for secretary. We a re so sorry to hear of the passing of Bonnie Ezzell. Our prayers go out to her sister Sue, and all her family. She will be missed as a valued teacher and member of SAM! 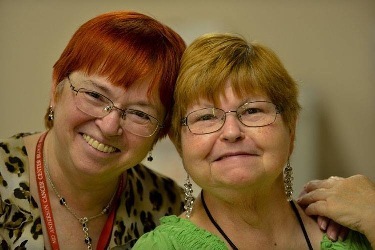 Sue (left) and Bonnie Ezzell. Photos of TEMPLE CLASSES have been posted! Check the tabs for WWW Workshops 2015 Class Photos! !